Campaign: The "Last Great War" (World War 2) ended abruptly in 1944 when the Axis superhumans ("supers"), Der Ubermensch, La Donna Meraviglia and Sugoi Samurai, displayed their powers in Russia, Africa and the Pacific respectively. Today, the world is ruled by the Triumvirate Powers and all others have been slave-states, watched over by the Axis supers who act as overseers. In the region that was the United States, a resistance group "Sons of Liberty" fight against the Axis Occupying Forces (AOF) while dissident scientists work in secret to find measures against the Axis supers and regain their freedom. 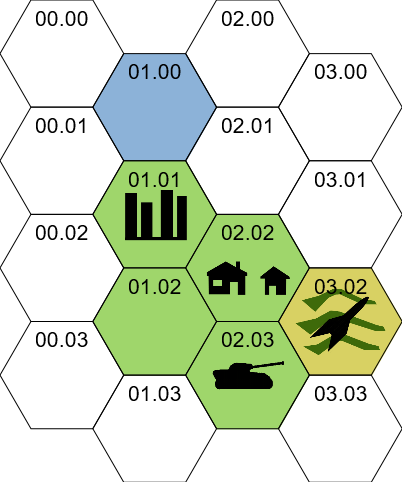 Homebase (Hex 0) (0101): Lakeside - This Great Lakes city is watched over by Übermensch Drei and a large force of German and Italian AOF soldiers. The city is to be the site of an upcoming meeting between German, Italian and Japanese high level officials. The Sons plan on kidnapping secretaries and deputies of those officials to get information on plans for the factories that are increasingly polluting the waters and sickening the people, as well as any details that will help the Resistance. Location 1 (0202): Town of Cityville - This sleepy suburban town is the center of activity for a special cell of the Sons, consisting people who've been training and taking experimental drugs to give them small extra-normal abilities against the Axis forces. They hide in plain sight as ex-veterans of the war; managing to hold off the effects of aging on their bodies through serums. They are protecting the scientists who are eagerly awaiting arrival of the alien equipment from the Dig Site, and fearing that the AOF may have already penetrated their secret group. Location 2 (0203): Verschuer Army Barracks - An armored and airborne cavalry division of the AOF (known as the "Grun Shirts") support Drei as he monitors the region in and around Lakeside and the eastern Great Lakes. During recent training of a new set of cadets, he was actually injured by a young woman, whose touch caused him great pain! This has not go unnoticed by both the Sons, who want to draw the mutant over to their side, and the training commandant, who will contact the Office of Science and Health to take her away for cleansing! Location 3 (0302): Dig Site - A secret archaeological excavation, disguised as a construction project, has discovered four large metallic flying vehicles that date back almost 150,000 years ago; they contain advanced medical equipment that have strange effects on humans. One brave test subject is already exhibiting signs of super strength and ability to walk through solids! The Sons are trying to move the objects to the town Cityville, but a collaborator has tipped off the police and they're planning an ambush for the convoy.